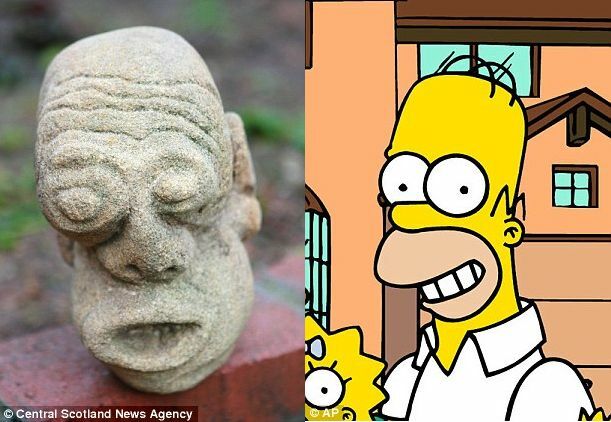 Whoever carved the statue would not have had TV's favourite cartoon anti-hero in mind - but there is no doubting the resemblance of this stone head to Homer Simpson. It was found by Rosalind and Donald McIntyre when they were clearing the bottom of their garden at their home in Fife, Scotland, earlier this year. The couple were working in their garden when Mrs McIntyre picked up the head. She took it to St Andrews Museum, and the discovery has been referred to the National Committee for Carved Stones of Scotland.